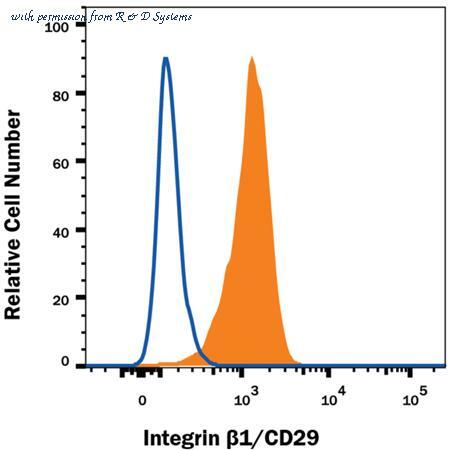 Detection of Integrin beta 1/CD29 in B16-F1 Mouse Cell Line by Flow Cytometry. B16-F1 mouse melanoma cell line was stained with Rat Anti-Mouse Integrin beta 1/CD29 Monoclonal Antibody (Catalog # MAB2405, filled histogram) or isotype control antibody (Catalog # MAB006, open histogram), followed by Phycoerythrin-conjugated Anti-Rat IgG Secondary Antibody (Catalog # F0105B ). 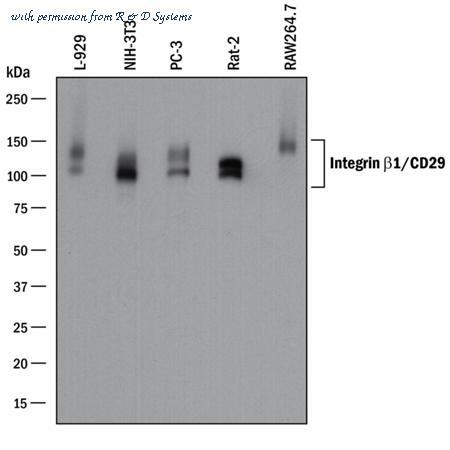 Detection of Mouse and Rat Integrin beta 1/CD29 by Western Blot. 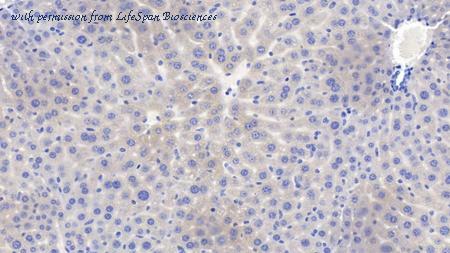 Western blot shows lysates of L-929 mouse fibroblast cell line, NIH-3T3 mouse embryonic fibroblast cell line, PC-3 human prostate cancer cell line, Rat-2 rat embryonic fibroblast cell line, and RAW 264.7 mouse monocyte/macrophage cell line. 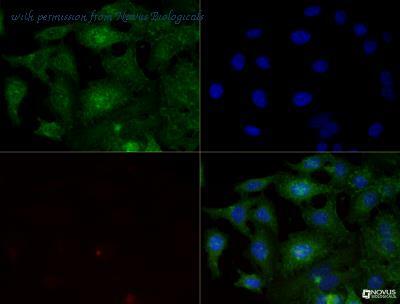 PVDF membrane was probed with 1 ╡g/mL of Goat Anti-Mouse/Rat Integrin beta 1/CD29 Antigen Affinity-purified Polyclonal Antibody (Catalog # AF2405) followed by HRP-conjugated Anti-Goat IgG Secondary Antibody (Catalog # HAF017 ). 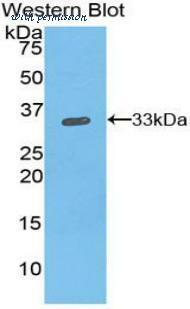 A specific band was detected for Integrin beta 1/CD29 at approximately 110-140 kDa (as indicated). This experiment was conducted under reducing conditions and using Immunoblot Buffer Group 1 . 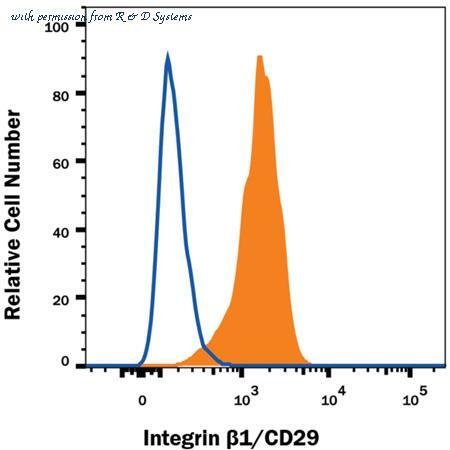 Detection of Integrin beta 1/CD29 in B16-F1 Mouse Cell Line by Flow Cytometry. 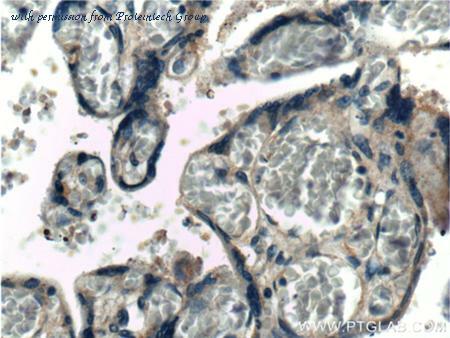 B16-F1 mouse melanoma cell line was stained with Rat Anti-Mouse Integrin beta 1/CD29 PE-conjugated Monoclonal Antibody (Catalog # FAB2405P, filled histogram) or isotype control antibody (Catalog # IC006P, open histogram). View our protocol for Staining Membrane-associated Proteins . Figure A. RPE conjugated rat anti mouse CD3 ( MCA500PE ) and FITC conjugated hamster IgG isotype control ( MCA2356F ). Figure B. RPE conjugated rat anti mouse CD3 ( MCA500PE ) and FITC conjugated hamster anti mouse CD29 ( MCA2298F ). All experiments performed on red cell lysed murine peripheral blood gated on lymphocytes in the presence of murine SeroBlock (BUF041A). 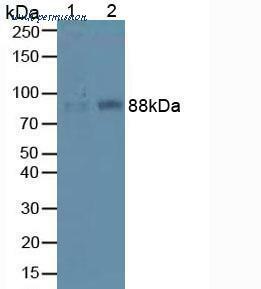 Western Blot: Integrin beta 1/CD29 Antibody (SR30-03) [NBP2-67312] - Analysis of Integrin beta-1 on human liver lysates using anti-Integrin beta-1 antibody at 1/1,000 dilution. Western Blot; Sample: Lane1: Mouse Liver Tissue; Lane2: Mouse Lung Tissue. Western blot of recombinant ITGB1 / Integrin Beta 1 / CD29. This image was taken for the unconjugated form of this product. Other forms have not been tested.